Tamarack is one of the housing plans available at Spencer's Crossing. 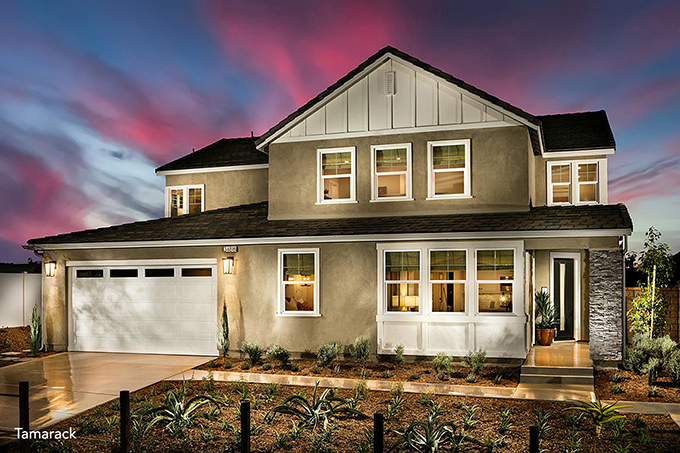 Spencer’s Crossing in Murrieta offers so much to come home to, with beautiful home collections and a vibrant lifestyle that makes every day one to remember. Homeowners can enjoy the best of outdoor fun at both The Oasis and The Club, two spectacular amenities that combined offer several swimming pools, a 3,500 square-foot Recreation Center, cozy firepits, BBQ areas and terraced seating. Getting active in the great outdoors is as easy as strolling to one of three impressive parks, including the 11.5-acre Sports Park; the 5+ acre Victory Park and 14-acre Heroes Park. Each sprawling park is distinguished by numerous amenities, ranging from basketball courts, baseball fields and tot lots to trails, doggy play areas and picnic spots. To further Spencer’s Crossing’s friendly, welcoming environment, the master-planned community regularly hosts well-attended events on site that bring neighbors together and inspire lasting friendships. Just some of the upcoming events this month include a throwback ‘80s dance party; a community Yard Sale; and St. Patrick’s Day Bingo. Plus, a Food Truck Roundup happens on the last Saturday of every month through May at The Oasis. Spencer’s Crossing’s prime Murrieta location is more convenient than ever due to the new Clinton Keith extension, which reduces drive time and leads directly to the community. The prime setting also provides easy access to nearby shopping centers, excellent restaurants, challenging golf courses and recreation, while Temecula’s enchanting wineries and other attractions are just a short drive from home. Homeowners with children enjoy access to a quality education at highly regarded school districts that include Murrieta Valley Unified School District, Menifee Union and Perris Union. Spencer’s Crossing extends across 600 naturally beautiful acres, creating a new kind of community designed for genuine family living with a dynamic environment brimming with recreation. Residents will find miles of meandering trails to enjoy, and great resort-style amenities, which include multiple pools, firepits, BBQs, terraced seating and more at The Oasis and a 3,500 square-foot recreation center with a Jr. Olympic swimming pool, children’s wading pool, spa, BBQ area, shade structures and a state of the art playground at The Club. Impressive sports and leisure parks are also on site, including the 11.5-acre Sports Park with lighted soccer and baseball fields, a basketball court, tot lots and a concession stand, as well as the 14-acre Heroes Park and 5+-acre Victory Park. To visit Spencer’s Crossing from Temecula, take the I-15 North, exit Clinton Keith Road and head east past the I-215 Freeway. Turn left on Leon Road, left on Baxter Road and follow the neighborhood signs. From Riverside, take I-15 South, exit Clinton Keith Road and head east past the I-215 Freeway. Turn left on Leon Road, left on Baxter Road and follow the neighborhood signs.